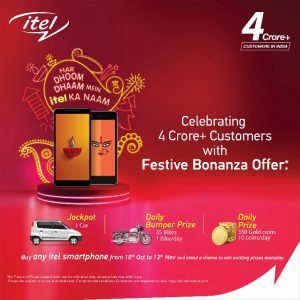 The itel family becomes stronger with over 4Crore + happy consumers across India! This momentous landmark was achieved in just about 2 years with a very strong distribution network backed by great service support and unmatched product experience for customers at the most affordable cost. To celebrate this path breaking achievement, itel announced a Mega Festive Bonanza offer for customers starting this festive season and also introduced another exciting entry level AndroidTM Oreo™ (Go edition) smartphone – A23, its first 5-inch display with face unlock smartphone under 5K INR. 1 Motorbike per day totalling up to 35 bikes for a period of 35 days. 10 Gold Coins/day totalling up to 350 Gold coins for the entire campaign period of 35 days. Well this is not all! Along with the exciting campaign and festive bonanza offer, get ready to experience the magnificence of 5-inch display along with premium-ness of face unlock and optimised Android Go operating system, only at a price of INR 4999 with itel A23. To make celebrations more powerful, itel is also set to launch A44 Power, another full screen smartphone with 4000mAh Li-Polymer battery and dual rear camera at an aggressive price. itel recently announced the launch of A45 smartphone, which is its first HD full screen smartphone with dual camera below 6K price.